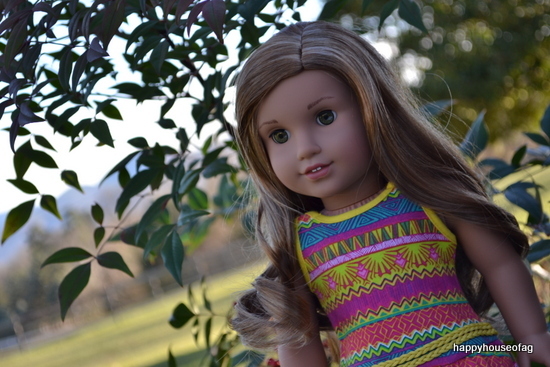 I think I like those pictures of Saige in the cherry tree too much. Oops? Oh well. I like the new look, it’s a lot simpler and easier on the eyes. But now I have to update the rest of my blog to match it. Ugh. Anyway! 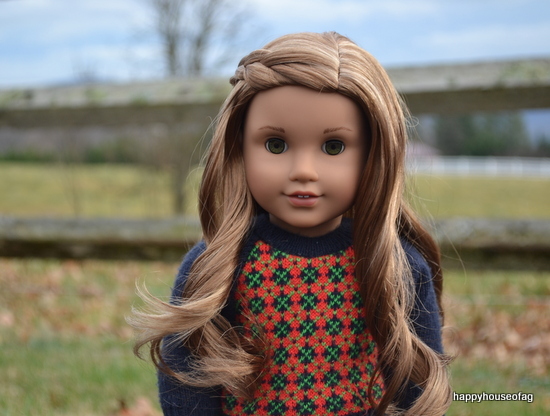 Pictures of Eve that I took around Christmas. 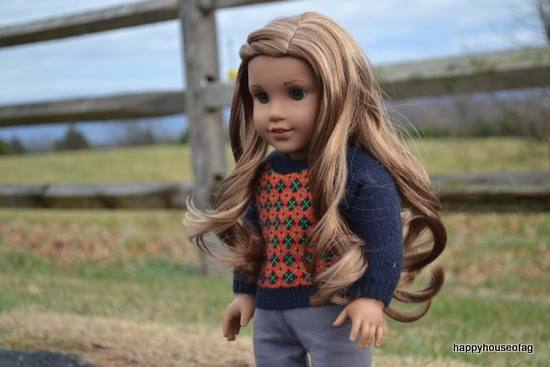 She looks so cute in Molly’s sweater. 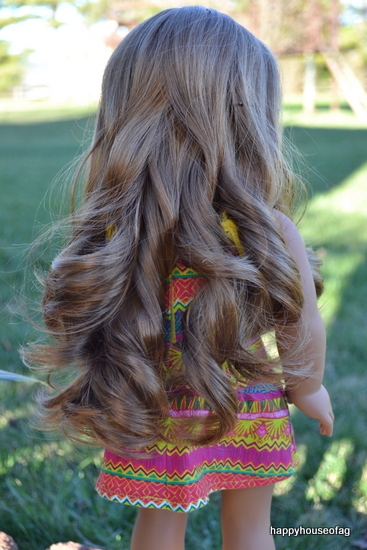 ^.^ I freaking love her hair, it’s so soft and curly and the highlights are gorgeous. Time for some shameless self-promotion! :D Anyone recognize the fence in the background? It was used in a photostory series called Road to Pamel that I did two years ago. You can read it here, if you haven’t done that already. And you should really check out my personal blog, let’s be lost. I’ve been posting on there a lot recently, and it’s pretty great, if I say so myself (I’m just kidding, it’s a trashy blog. Would you expect anything else?). Hey, guys! 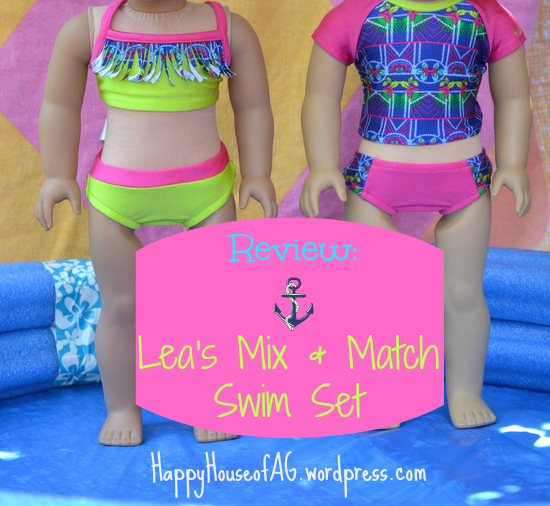 I’m finally getting around to reviewing the Lea’s Mix & Match Swim Set that I bought in January. The powers of procrastination, my friends. Let’s start with the lime green swim suit. 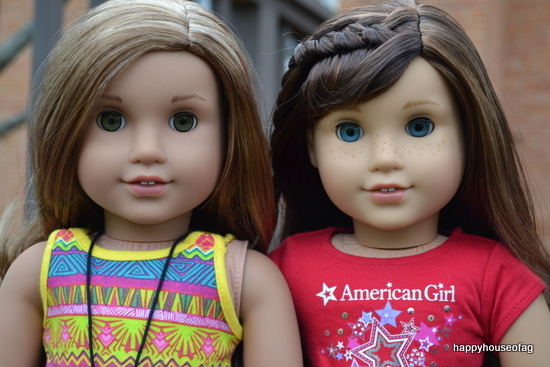 American Girl calls it a tankini, but let’s be honest: this is a bikini. 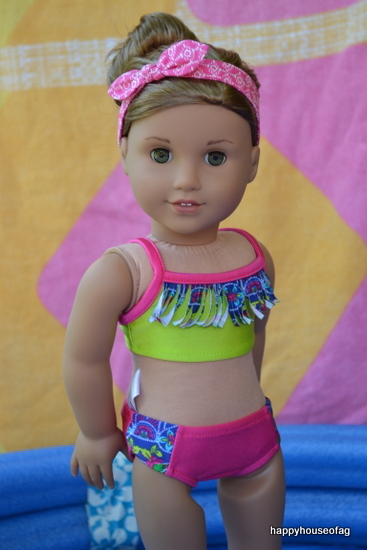 The bikini is lime green with hot pink edging. 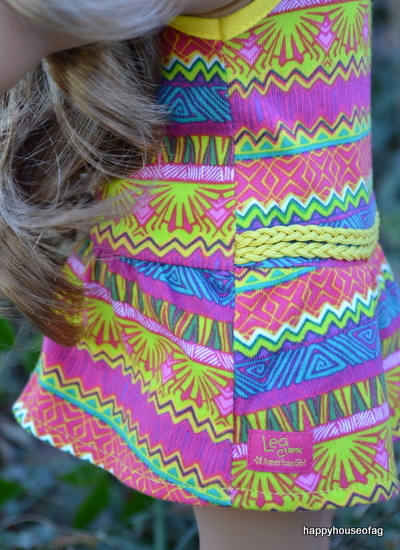 The fabric is stretchy, and feels like a real bathing suit. 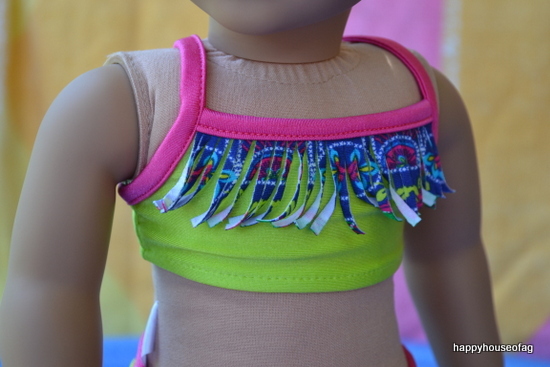 The fringe is made out of the same fabric as the rash guard that comes with this set. 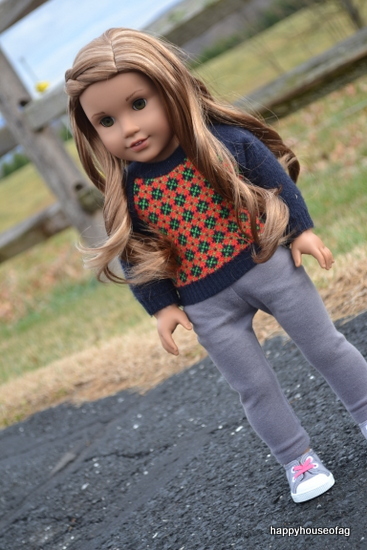 In all the stock pictures of this outfit, the fringes are perfectly flat, but that’s not going to happen with mine. They curl and flutter all over the place. 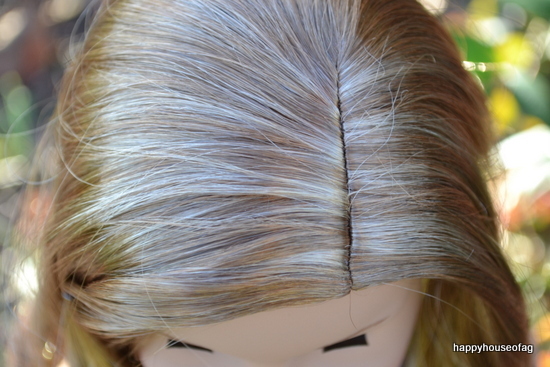 The only way to get them even close to flat is if you wet your fingers and stroke the fringes. The bikini closes in the back with velcro. 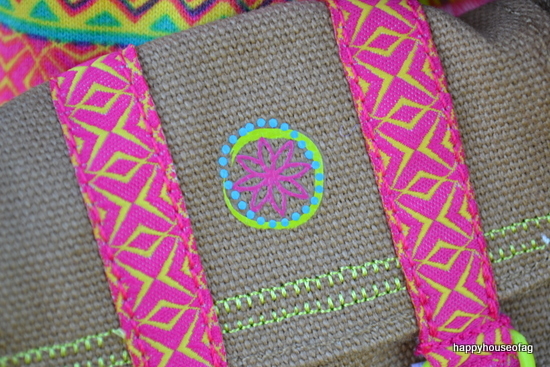 Like the bikini top, the bottom is made of lime green fabric with hot pink trim. 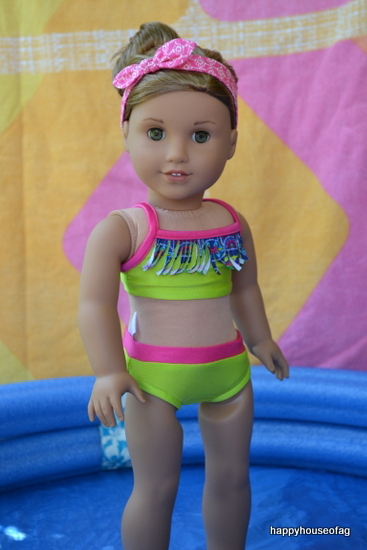 The bikini outfit doesn’t hide the doll’s tag, but if you stick it into the bottoms, it becomes slightly less noticeable. 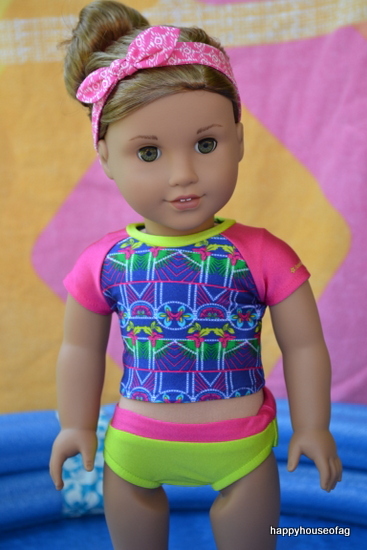 Let’s move on to my personal favorite, the rash guard outfit. 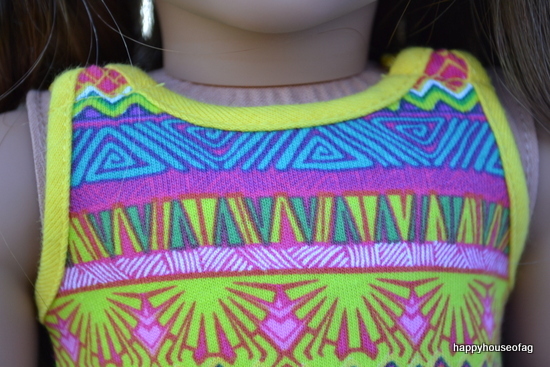 The top has hot pink sleeves and lime green edging around the neck. 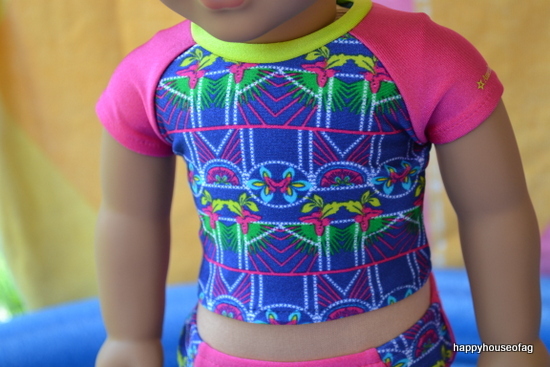 The rash guard is mostly made of a blue fabric with a busy neon pattern on it. It velcros in the back. 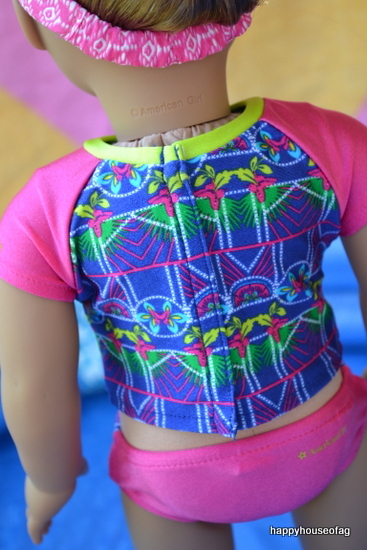 The bottoms are pink, with a panel of blue patterned fabric on the hips. 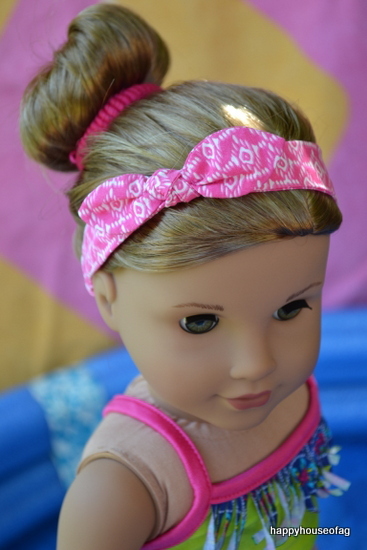 Lea’s Mix & Match Swim Set also comes with a stretchy headband. 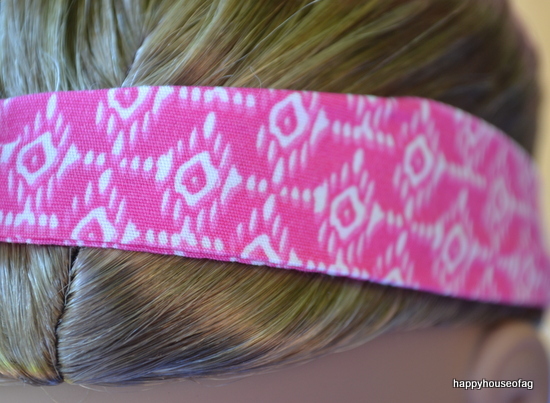 It’s pink with a white pattern. 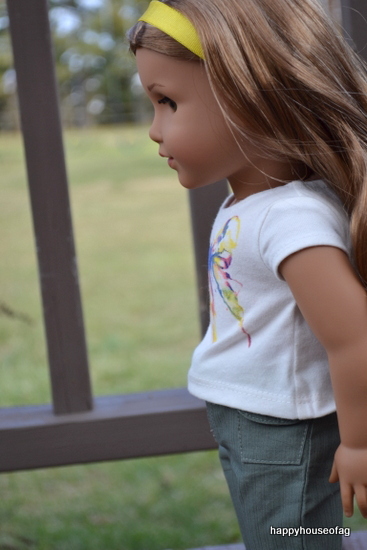 Elastic is sewn into the back of it, and it slips over the doll’s head. Obviously, you can mix and match this set (hence it’s name), but I prefer keeping the rash guard outfit and the bikini outfit to themselves. I guess the colors just don’t work as well. 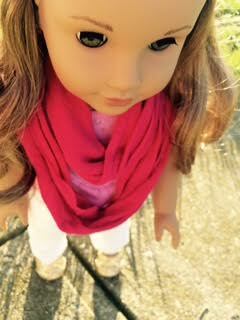 Hot pink sarongs were given out at Lea Clark’s debut, and they work perfectly with the swim suits. 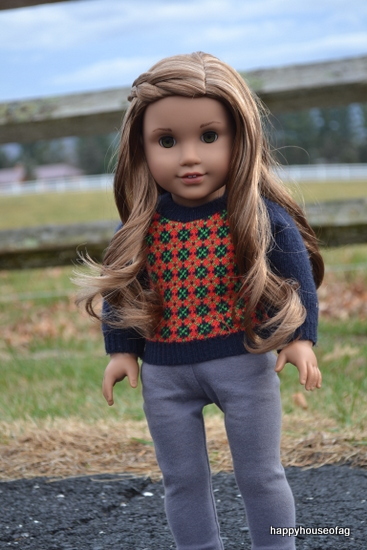 Buy this outfit from American Girl for $34 HERE. Do you live near the beach or have your own pool? I don’t, but my neighbors let us use their pool every summer. Hello! 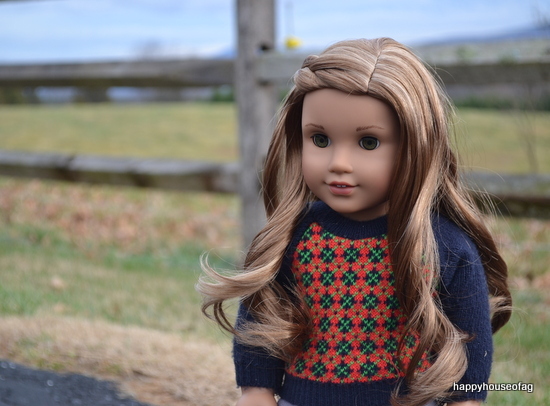 Nicole from Dolls With a Passion (a blog you should totally check out) sent me a guest post: a photoshoot of her doll Lea. 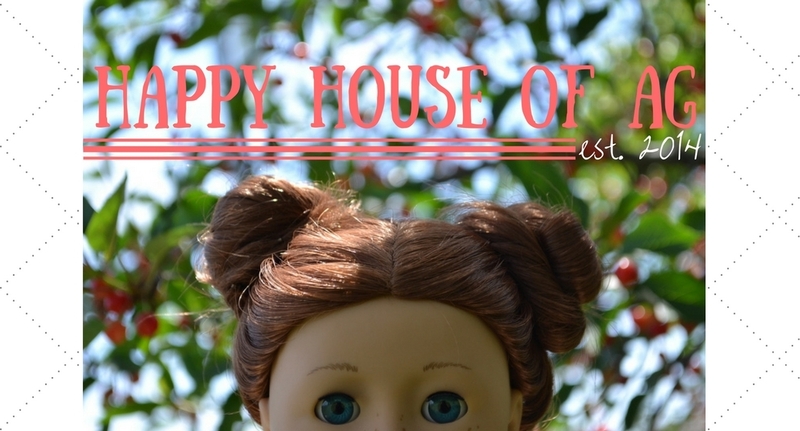 Want to send me a photoshoot/photostory/craft/doll-related-whatever and have it posted on Happy House of AG? Go to the Get Featured page and follow the directions! Hello! 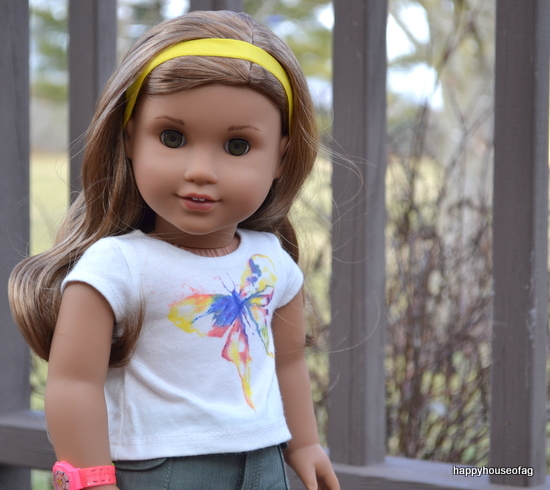 Today, I’m going to be reviewing an outfit from the collection of Lea Clark, American Girl’s newest GOTY doll: the Rainforest Hike Outfit. 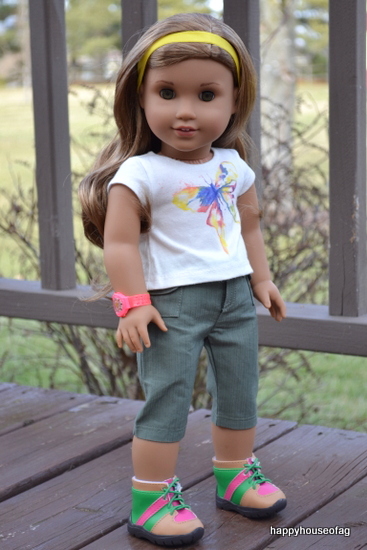 The outfit comes with a T-shirt, cargo pants, hiking boots, a belt, a watch, and a headband. 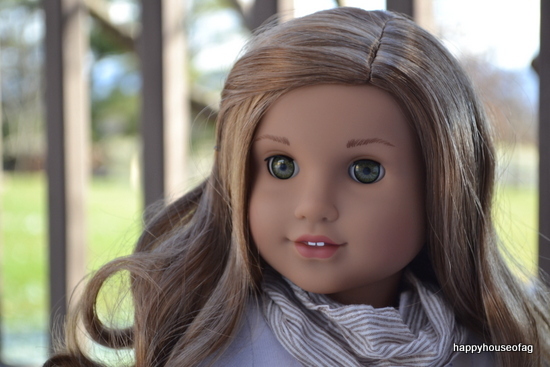 It’s priced at $34. 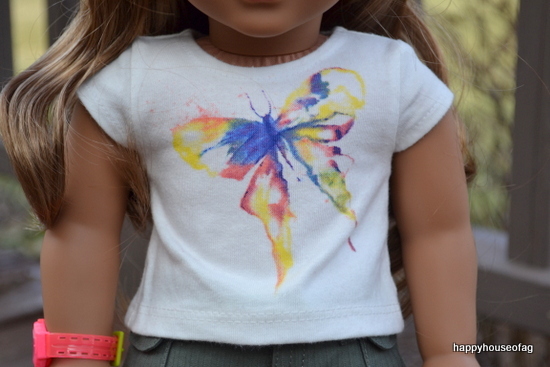 The white T-shirt has a beautiful butterfly design on it, described by American Girl as a “watercolor butterfly.” The shirt velcros in the back. 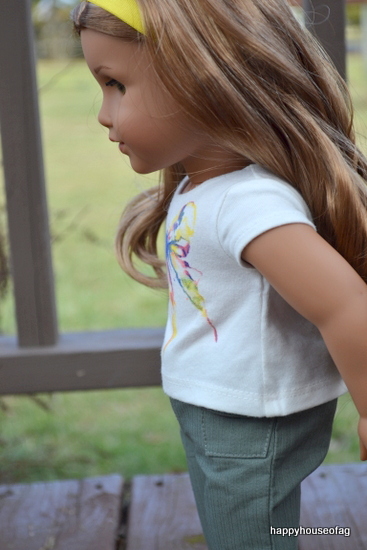 Lea’s cropped cargo pants are a grayish-green color. 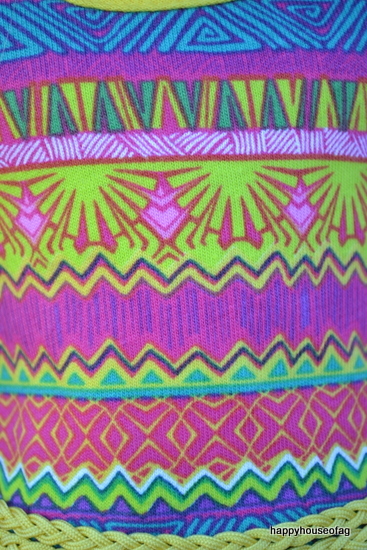 There are parallel lines in the fabric, but you don’t really notice them until you look closer. There are two nicely sized pockets. 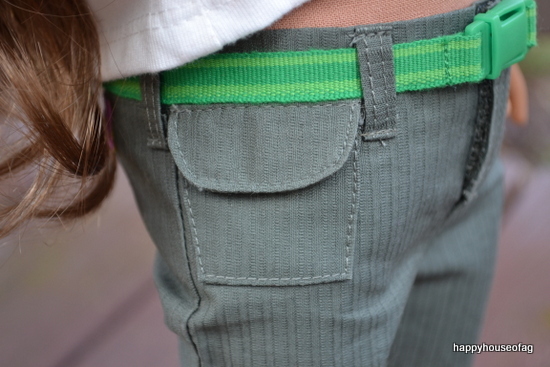 The pocket flaps lift, and there’s enough space to put something small into the pockets. 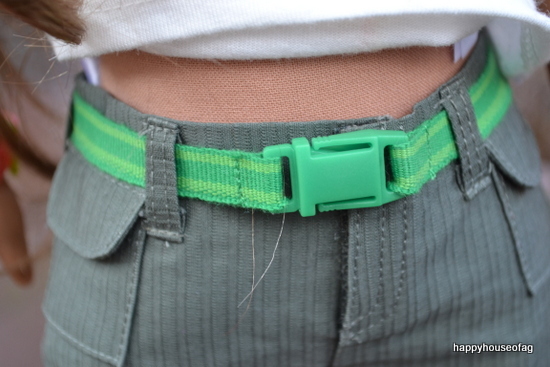 Functional belt loops go the whole way around the pants. 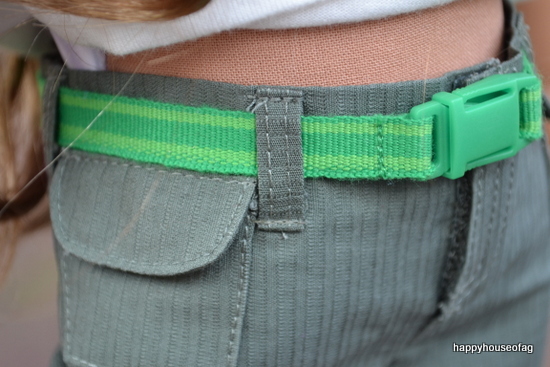 The striped green belt is not attached to the pants. It closes with a large plastic belt buckle. The belt is surprisingly long. The outfit in the second image is more pleasing, because the belt isn’t making a lump beneath the shirt. I’ll most likely use the Rainforest Hike Outfit without the belt. Of course, I could hike (pun intended XD) the shirt up above the belt so that it can be seen, or tuck the shirt into the pants, but I like it better without the belt at all. 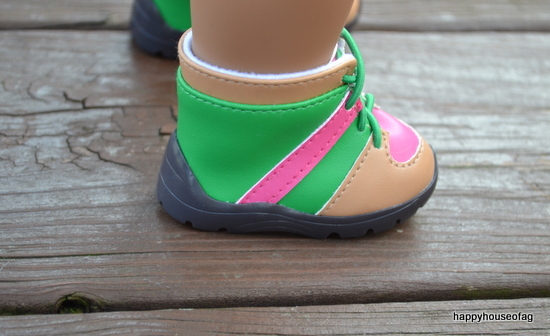 Moving on to Lea’s shoes! 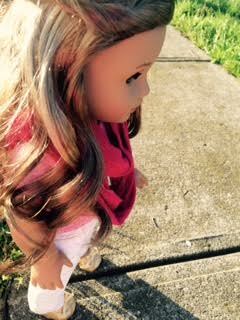 They are made of a tough, leathery fabric, with thick plastic soles. 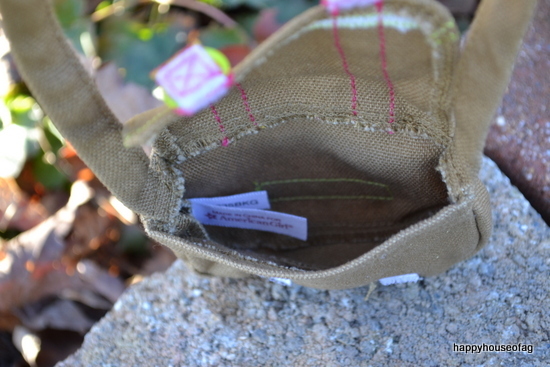 The hiking boots have beige, pink, and green fabric on them. 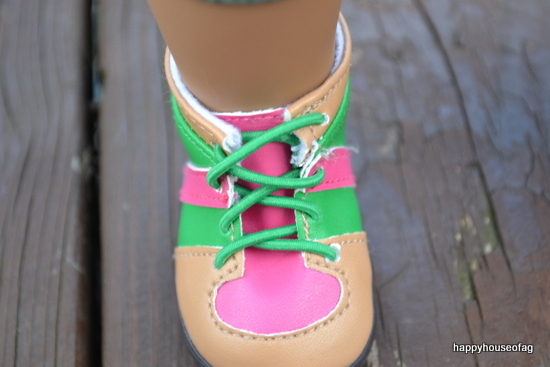 The boots lace up with a green stretchy rope. 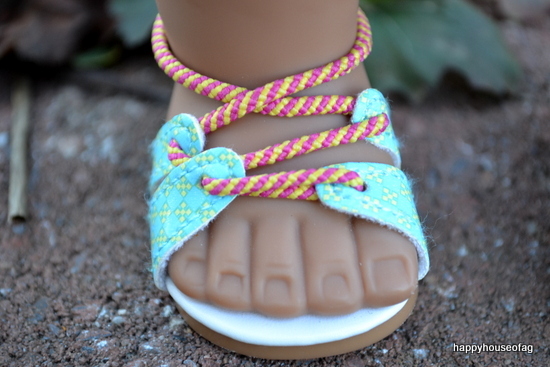 In order to put them on, you don’t have to loosen strings or undo velcro or anything like that; the fabric is simply flexible enough to let the doll’s foot slip right in. 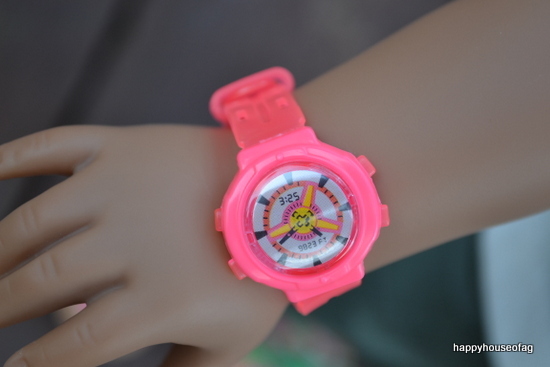 Next up, Lea’s watch! 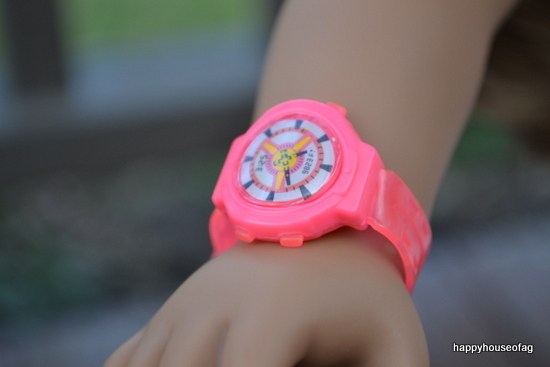 It’s made out of hot pink plastic. 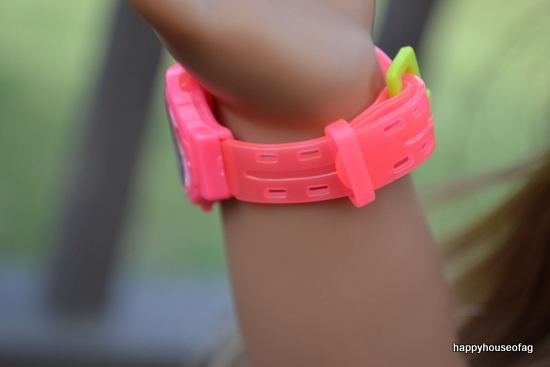 Clear plastic protects the watch face. There are bumps on the sides of the watch that are supposed to be buttons. A better look at the watch face. The watch goes on like the real thing: you have to stick the lime green clasp through one of the holes in the flexible watch strap. You can even slip the end of the strap through a hard plastic thing that slides back and forth (such great description on my part! *eye roll* But seriously, does anyone know what this thing is called?)! 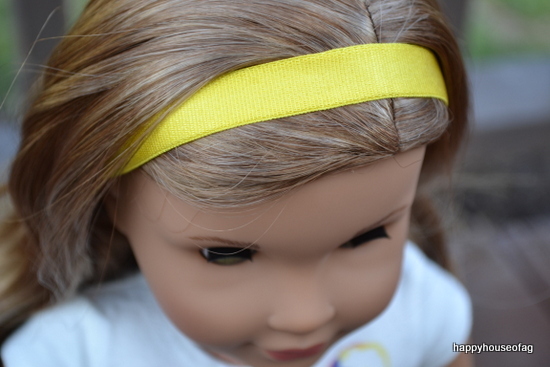 The Rainforest Hike Outfit also includes a yellow headband. 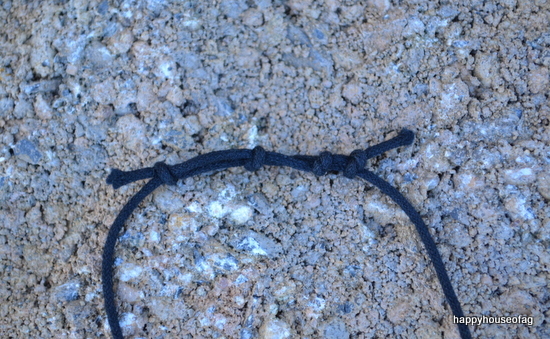 It’s about a centimeter wide, and made of elastic. 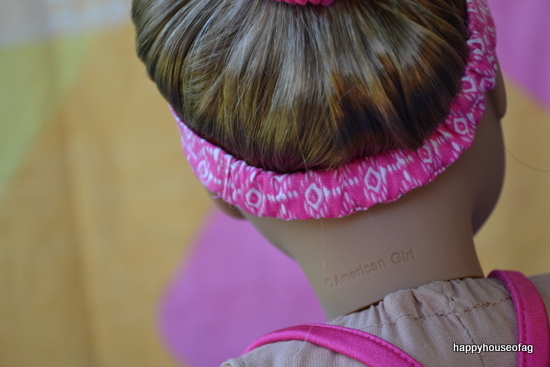 There’s a bow on the headband, but I prefer to style it so that the bow is in the back. 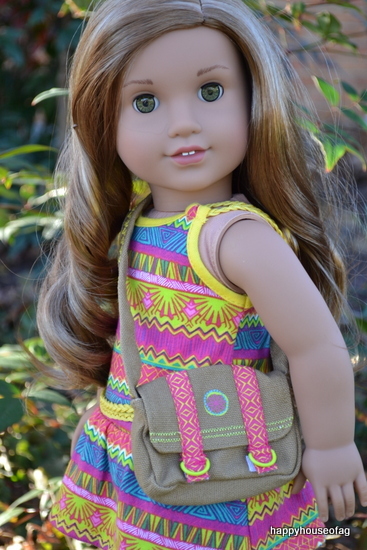 Overall, I absolutely love the Rainforest Hike Outfit. 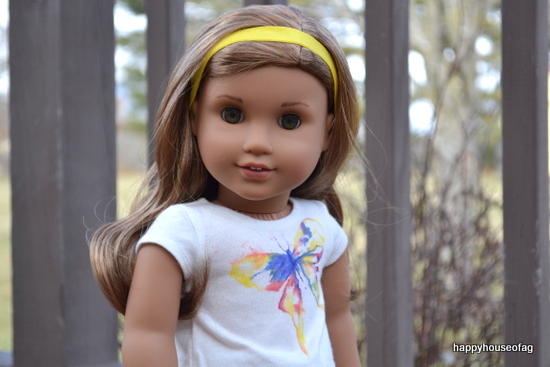 It looks amazing on Lea Clark, and I bet it would look great on other American Girl dolls as well. It’s got a lot of mix-n-match potential! 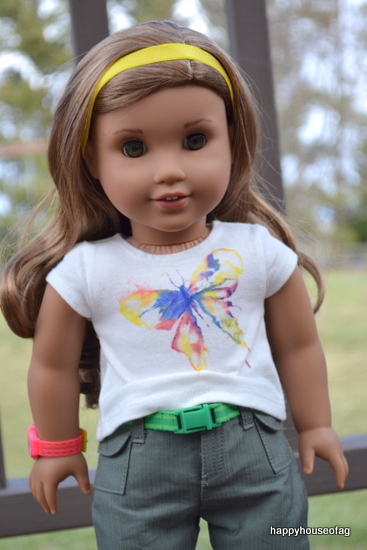 I can see the T-shirt and the cargo pants going with lots of different outfits. 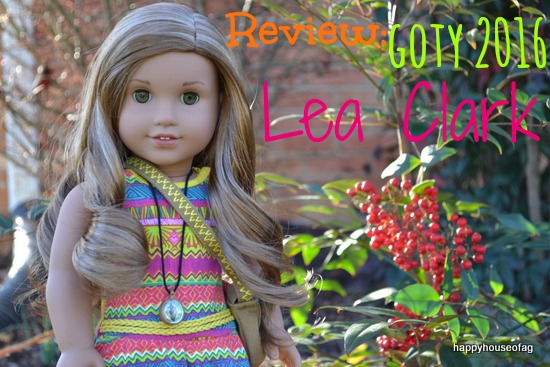 Today, I will be reviewing American Girl’s newest doll, GOTY 2016 Lea Clark! 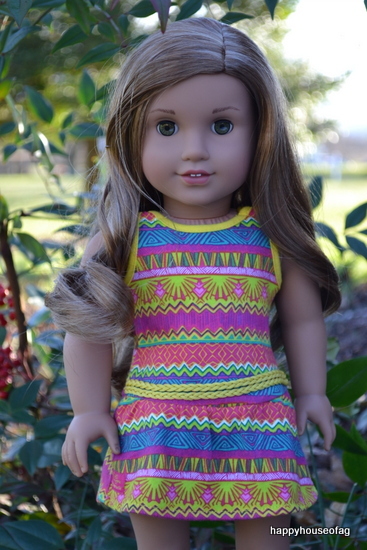 Let’s start with the doll herself. Lea is gorgeous, and quite unique. 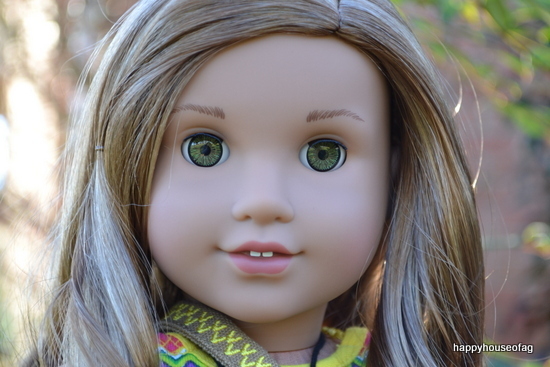 Her wavy caramel hair, tanned skin, and never-before-seen hazel/brown eyes give this 1/8 Brazilian beauty an exotic look. 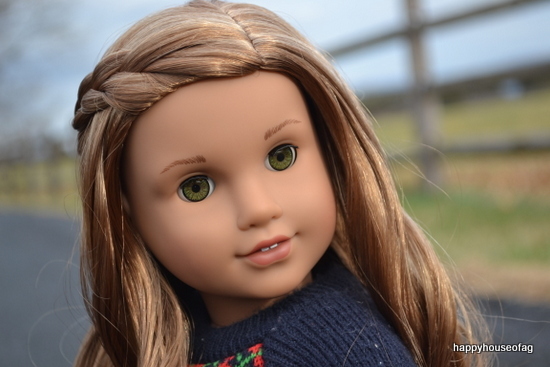 She has the Josefina face mold. 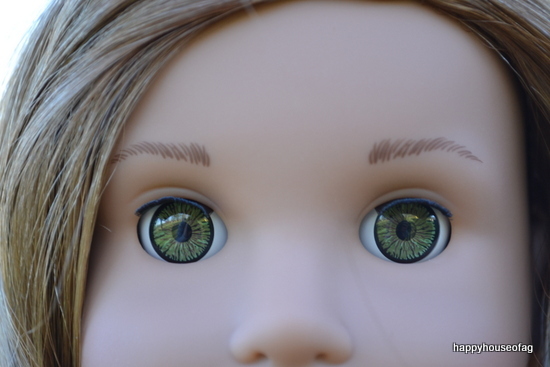 Her eyes have a thin band of black around them, and are hazel with some brown near the pupil. 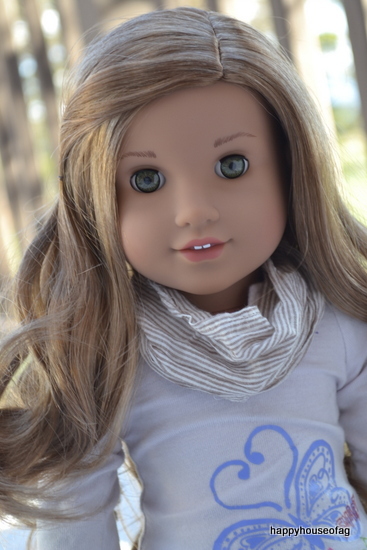 Lea Clark is the first American Girl doll to have this eye color. 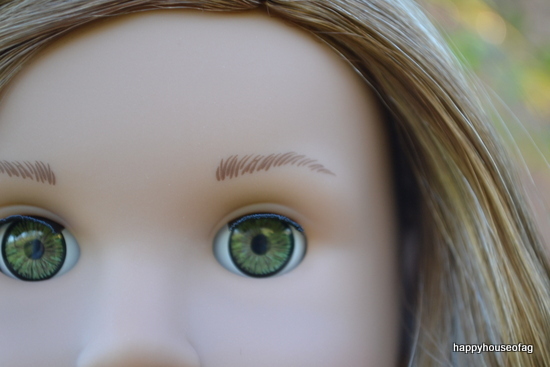 She has thick, feathered eyebrows, and they have a slight arch to them. 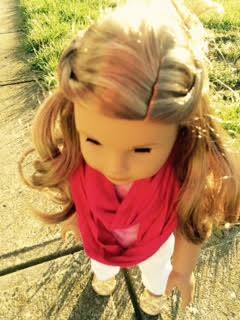 Her hair is soft, and is parted on the side. 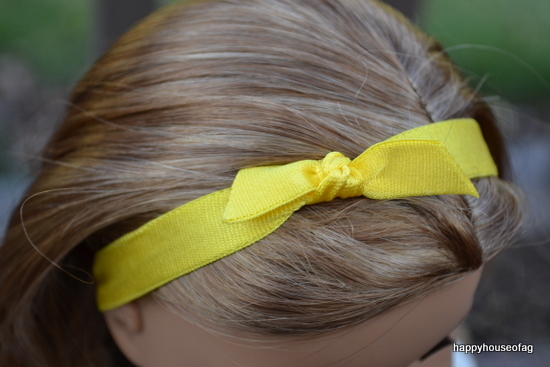 Lea’s hair has more than one color in it. 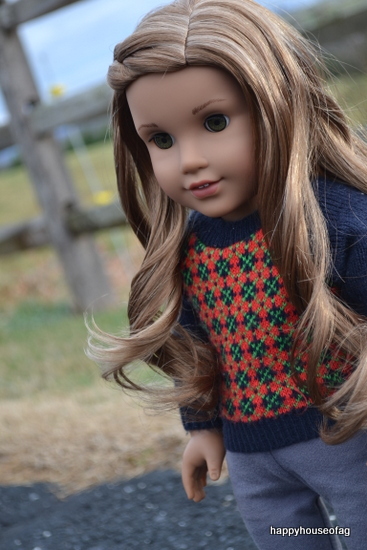 Caramel, blonde, light brown, even a little bit of auburn are all in her hair. 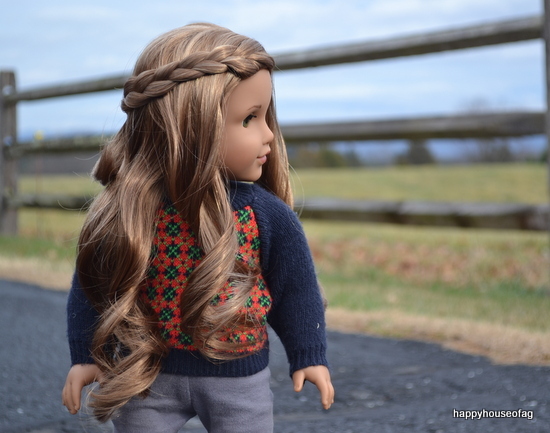 Her wavy hair comes down to her hips, and is layered. 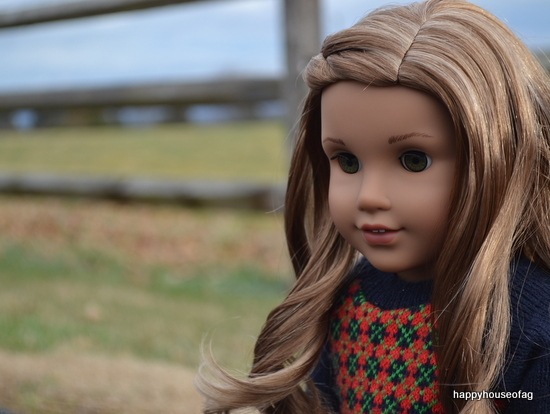 There’s a section of hair in the front that’s about an inch and a half shorter than the rest. 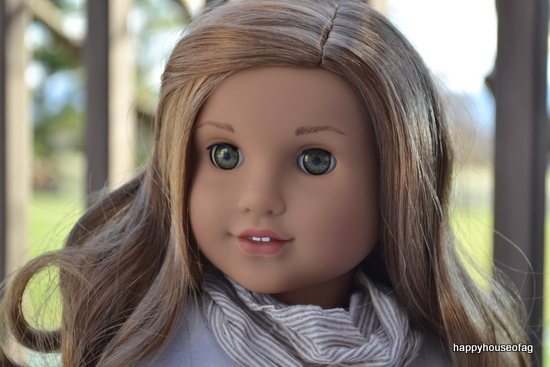 It could just be my Lea doll, but the hair on the left side of her head doesn’t curl nearly as well. The section in the front becomes straight in just minutes after I’ve curled it. 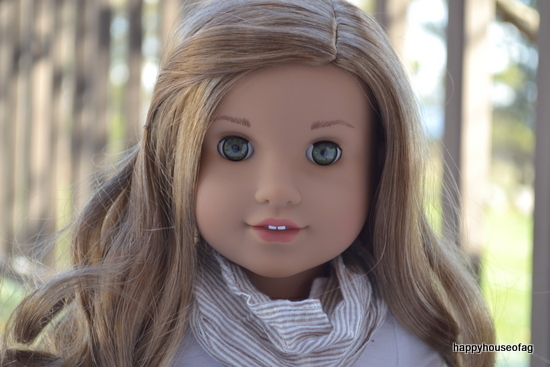 To other Lea Clark owners: does your doll have the same problem? 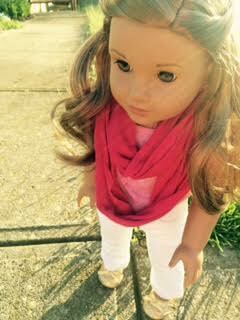 Unfortunately, Lea has no neck strings. 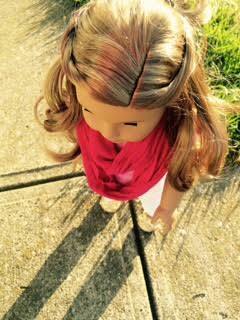 Instead, American Girl tied her head on with a zip-tie, which makes it very difficult to move her head. The only good thing I can think of about the zip-ties is that photographers won’t have to deal with neck strings getting in their pictures. 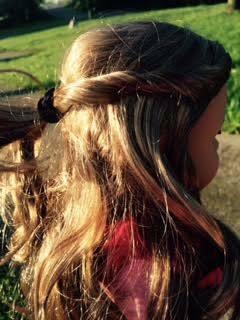 But it’s definitely a problem for people who want to tighten Lea’s limbs or customize her, since there’s not a way to tie her head back on. 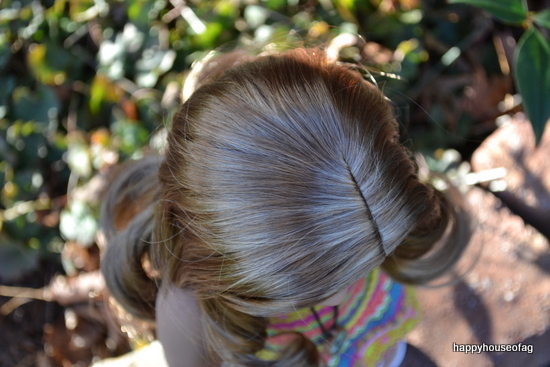 Lea has darker skin than most of my dolls. In this picture, you can see how different Lea’s skin is in comparison to Grace Thomas’s (GOTY 2015). 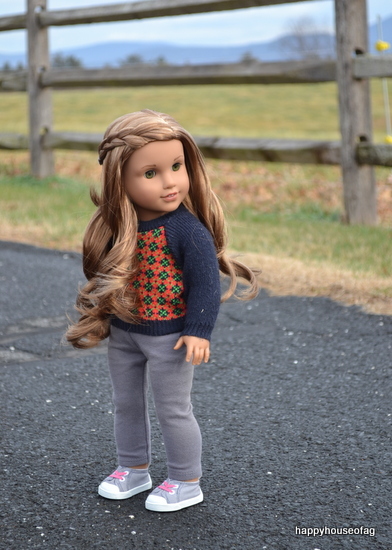 Moving on to Lea’s meet outfit! 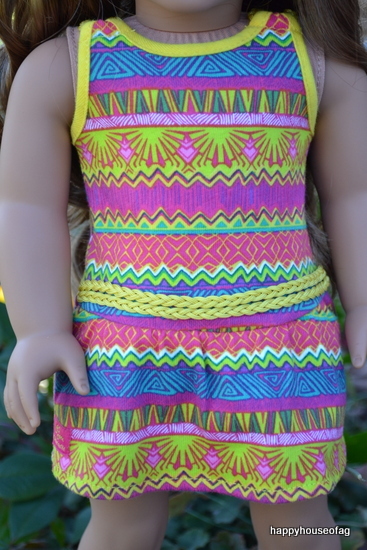 It’s a sundress with a crazy and colorful geometric pattern. 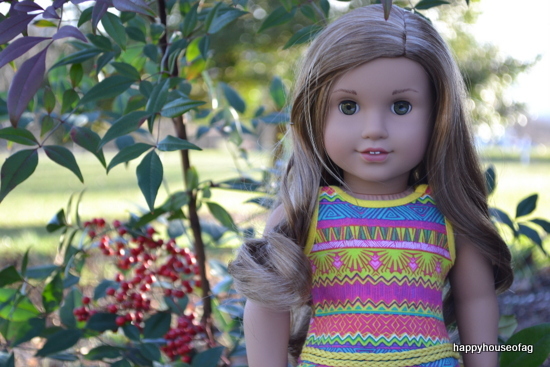 A strip of bright yellow fabric edges the neckline. 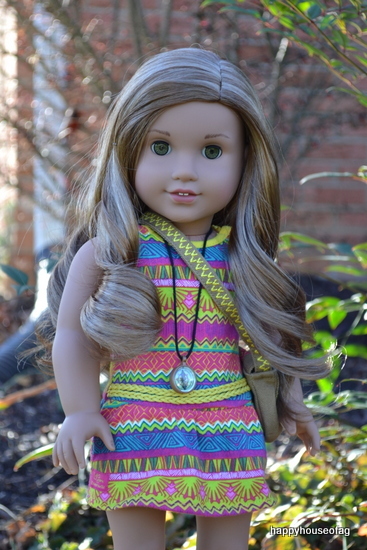 Two braided strands of yellow rope go around the waist of Lea’s dress. 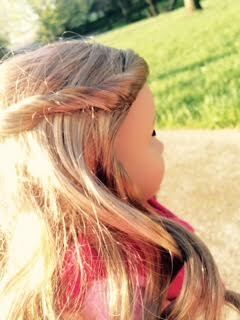 Sadly, the braids don’t go all the way around. 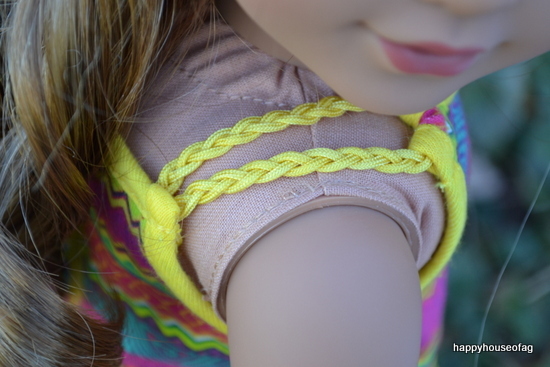 The sleeves are two braided ropes, the same kind that goes around the dress’s waist. Lea’s sandals are . . . interesting, to say the least. 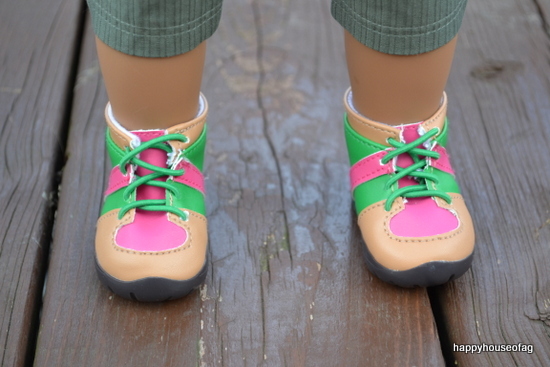 Pink and yellow-striped ropes crisscross the shoes. 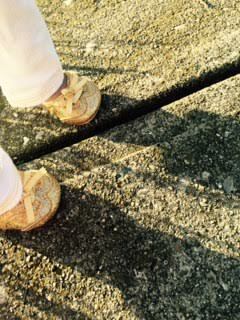 There’s a design of little yellow Xs on the sandals. They close in the back with velcro. 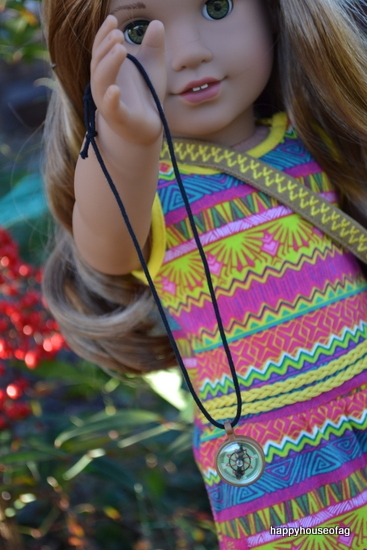 Lea comes with a compass necklace. The arrow really spins! 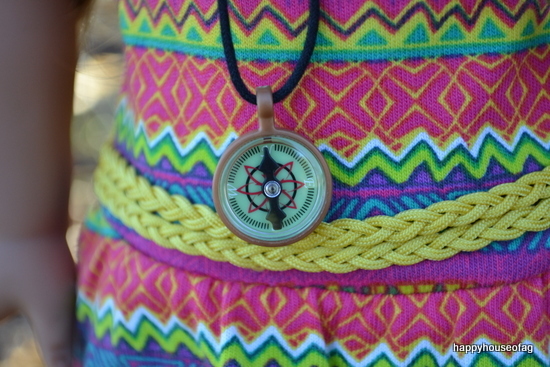 The compass pendant is on a black cord. 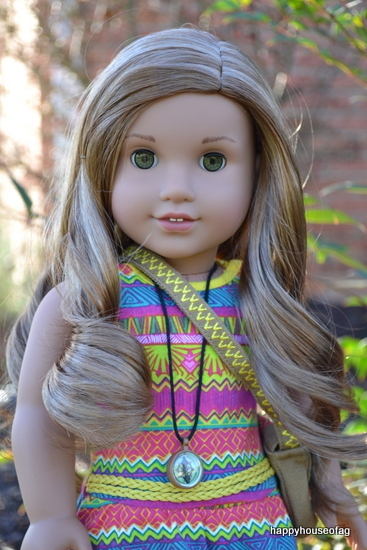 You can adjust the length of Lea’s necklace by moving the knots back and forth. 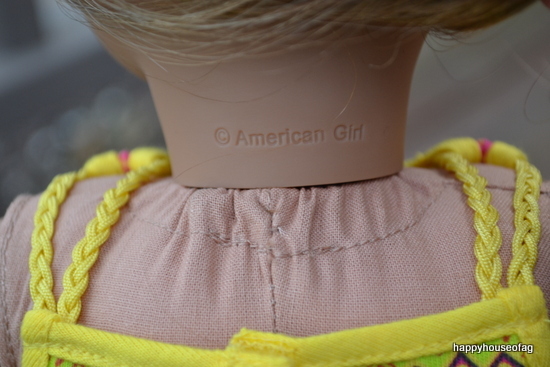 I myself have some trouble working the knots, and I can’t imagine how hard this would be for younger girls. 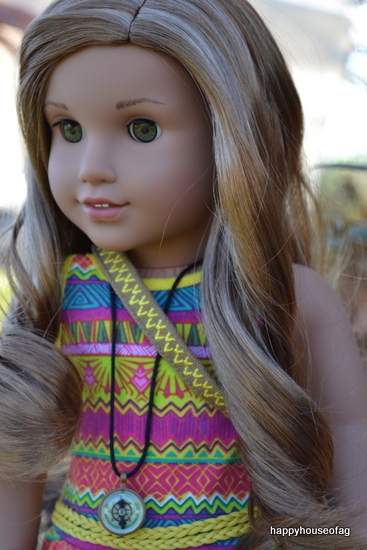 Lea Clark also comes with a messenger bag, described by American Girl as being made from canvas. 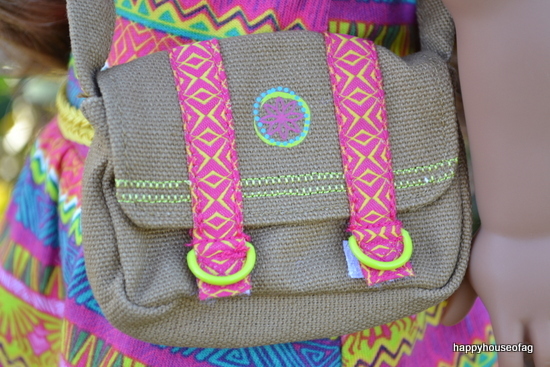 The bag is a crossbody. 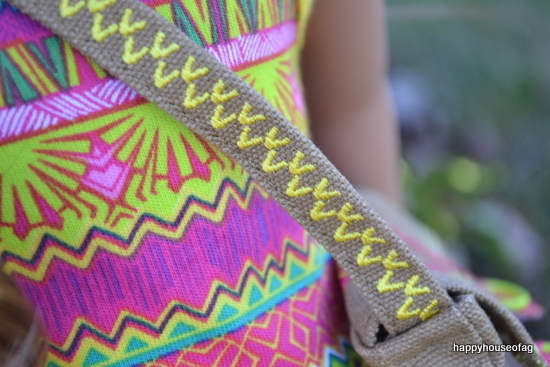 There’s a pattern of yellow triangles on the strap. 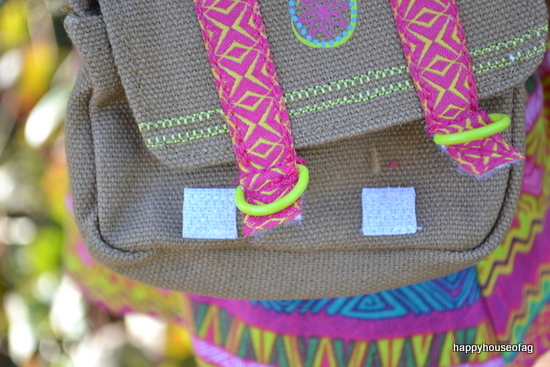 There’s a neon flower on the bag’s flap. It closes with two velcro squares. The inside of the bag. 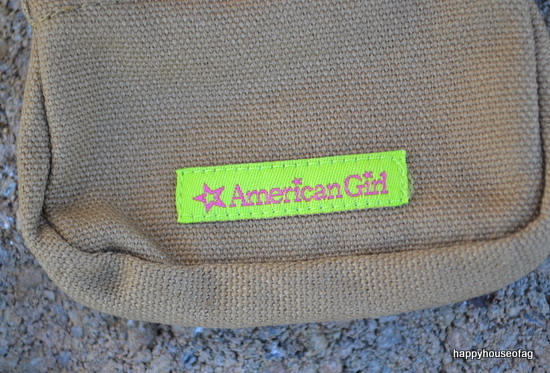 American Girl’s neon green ego tag is on the back of the messenger bag. 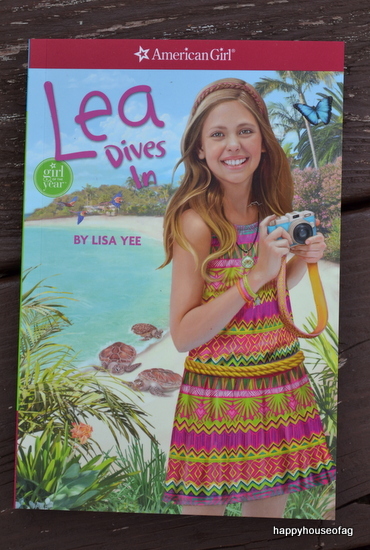 Lea comes with her first book, Lea Dives In, by Lisa Yee. I liked it a lot more than Grace’s books — I could relate to Lea much better (the annoying nickname given to her by her older brother, her love of photography). I never really liked baking, but travel is something that excites me. 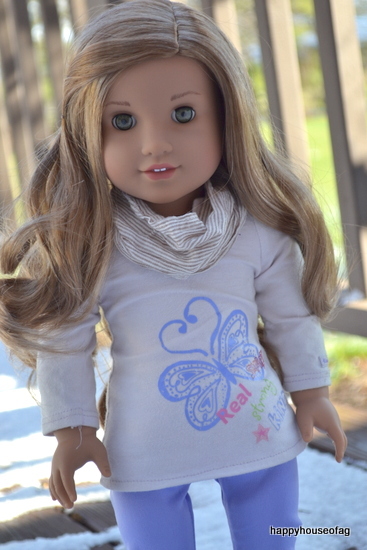 Overall, Lea Clark is a beautiful doll, and I definitely recommend her!